Fifteen hours of solid rain is expected today. Maybe more. This pretty much sums up how I feel today. Topsy, tangled, broken, with flashes of violent red and a tag marking it to be taken away as junk, and curves everywhere waiting to trip one up. My entry for the weekly photo challenge theme of curves. This week’s photo challenge theme is “pure”. 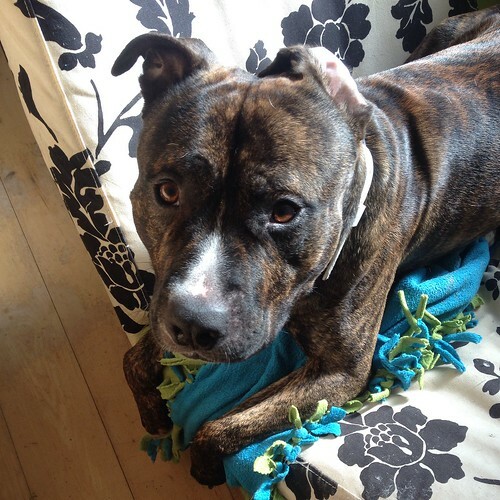 It’s pretty much pure love when I look at Charlie. 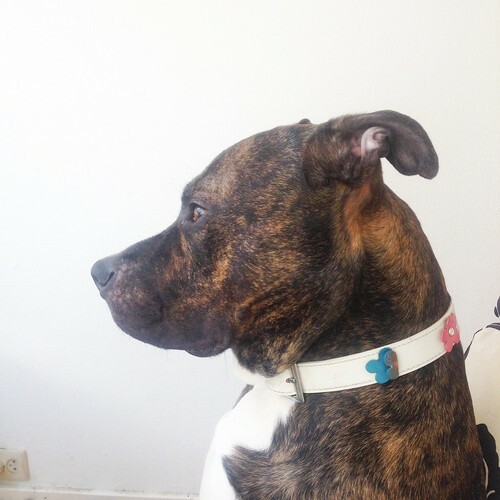 He has his moments, like any pet, but I am so absolutely in love with him. 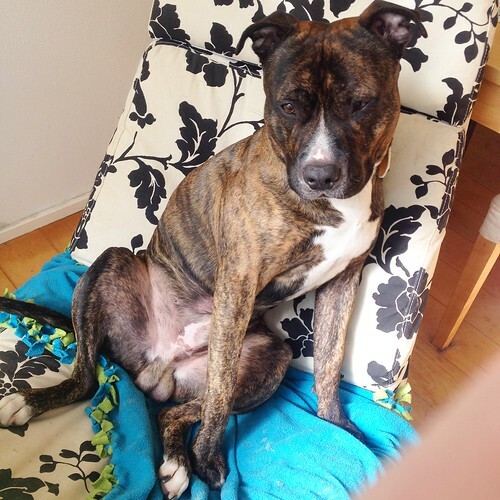 He’s an absolute sweetheart, well behaved, a total goofball, and pure stupid cute! 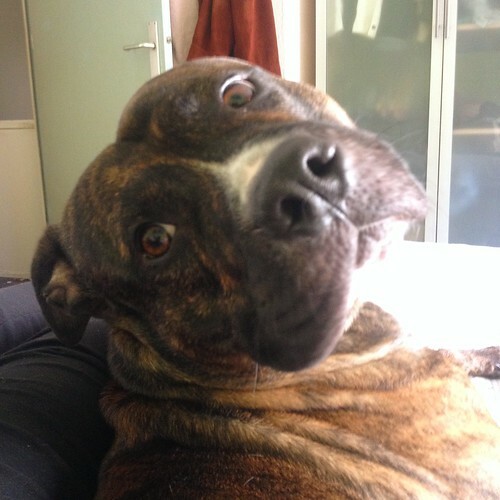 That face tends to get covered in kisses. He usually kisses back. 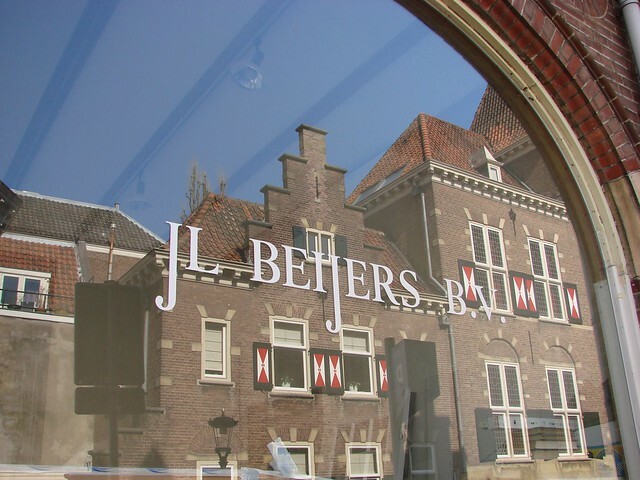 We visited the Centraal Museum last weekend to see all of the renovations finally complete. It’s still a stunning and highly creative museum. Even the shadows are works of art. This is my contribution to the Weekly Photo Challenge, whose theme this week is abstract. I was reminded of the WordPress Weekly Photo Challenge today, so I thought I’d see what this week’s theme is and see if I have anything that fits. Cirkel (circle) is the theme, and my first thoughts went to the canals and particularly the bridges that have half-circle arches that form a full circle when they reflect in the water of the canal. I was looking through past May photos to find one for my new header when I saw this shot and remembered that the Weekly Photo Challenge theme this week is motion. I like the blur of the scooter, like something from a Futurist painting. But I also love the background of all those bicycles, which suggest potential motion. There had obviously been a lot of motion going on to get all of those bicycles there. This week’s photo challenge theme is spring in all of its many glories and charms. 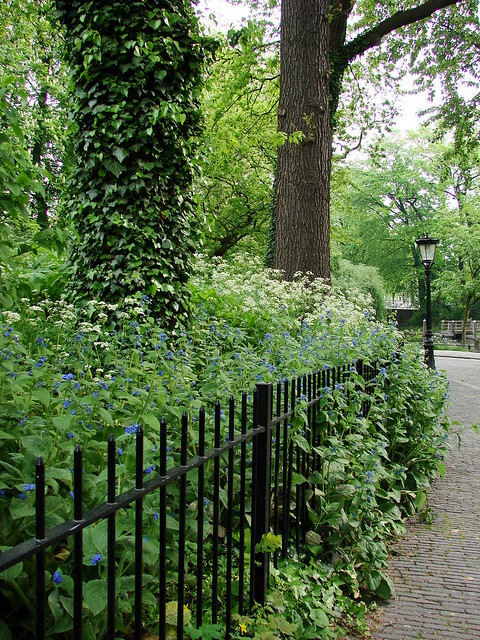 For me, spring is the return of walks around the city, admiring all the little nooks and crannies that come alive with greenery and blooms, both wild and intentional. Crocuses, tulips, and daffodils spring up in abstract masses in almost every grassy area surrounding the old city center. On a recent walk, I was blown away by the profuse greenery surrounding the Lievendaal villa. 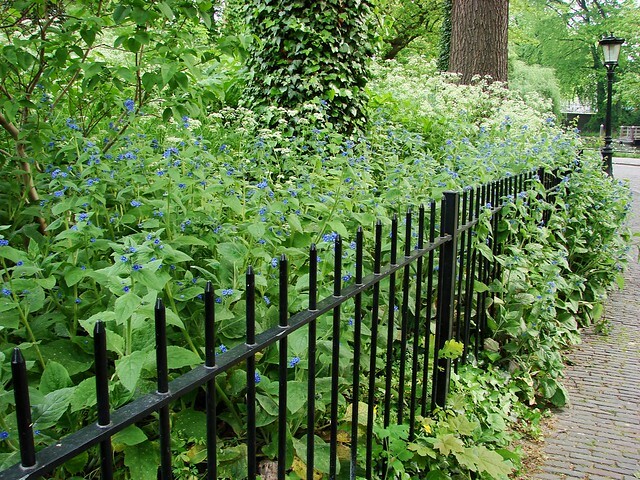 The shade of the trees, the intensity of the green, and the pops of blue from tiny flowers turned this little corner into a verdant wonderland that doesn’t seem like it will truly be contained by the wrought-iron fence. The theme of this week’s Weekly Photo Challenge (for which I’m just scraping in under the wire) is Monuments. I had thought of doing something a little less obvious, but when I saw some news stories this week, I figured I’d go with the obvious monument here in Utrecht: the Domkerk or St. Martin’s Cathedral. 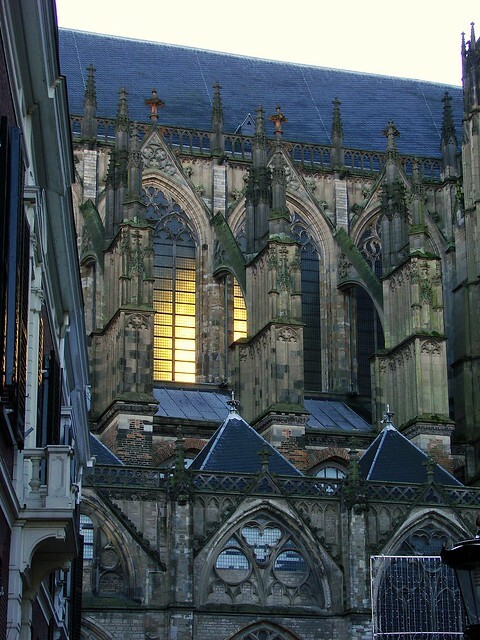 The best example of French Gothic church architecture in the Netherlands, the cathedral is a standout for a variety of reasons, including the fact that the nave of the cathedral was destroyed in a storm in the 1600s and never rebuilt. Various chapels and churches dedicated to St. Martin have stood there since around 700 AD. 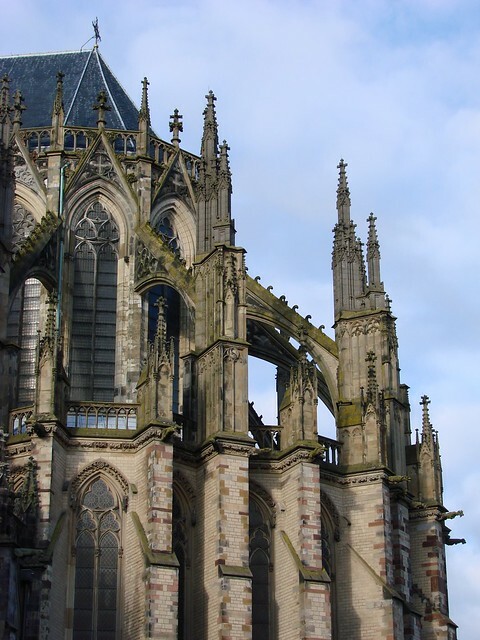 Construction of the current church began in 1254. As old as it is, and considering what it’s faced over the centuries, conservation and restoration are vital. 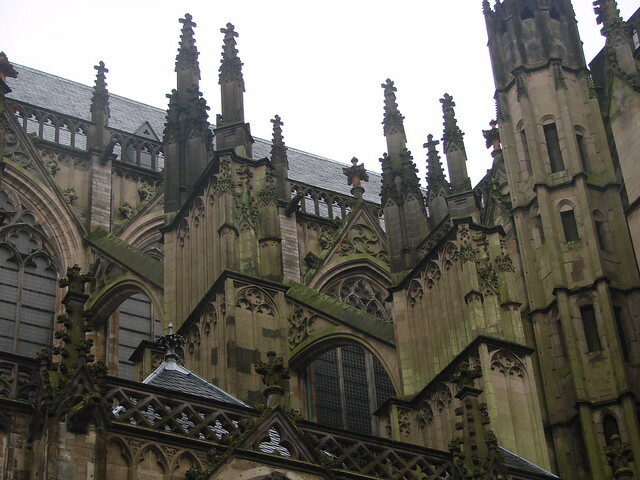 Currently, two of the buttresses (luchtbogen in Dutch) need to be repaired and restored. There is no government subsidy to help, so a crowdfunding campaign has begun, with the hopes of raising the €50,000 necessary for the work. 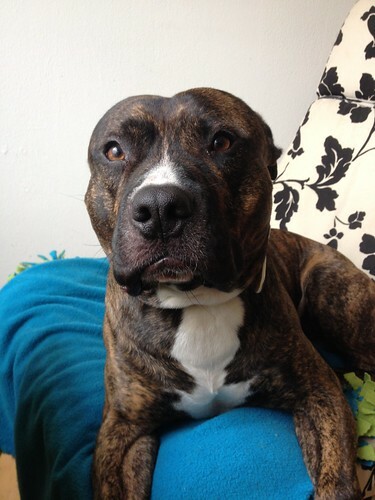 If you want to make a donation, go to the Draag de Dom website. As well as doing something good to help maintain this beautiful symbol of Utrecht, you also receive various rewards, depending on the size of the donation. 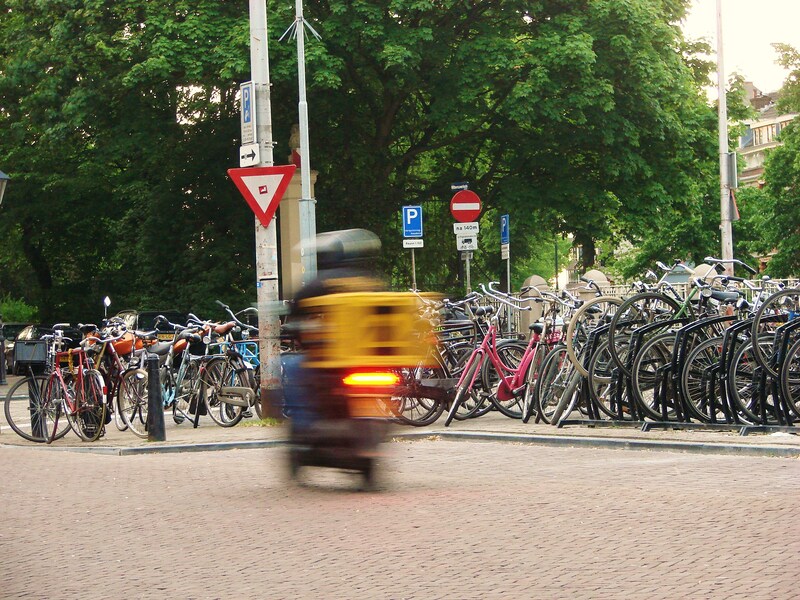 This week’s photo challenge theme is street life, which in Utrecht and most of the Netherlands, could easily be called bicycle life. It’s a rare moment that there isn’t a bicycle in sight, whether passing by or parked somewhere. I decided to focus on one short stretch of street (approximately .2 miles), which is part of the main street that runs east/west through the old city center of Utrecht. Moving from west to east, you pass Janskerkhof, the square surrounding Janskerk (John’s Church), which is the big church-like building in the background. The street is closed to through traffic now, so the only real traffic comes from buses and bicycles. 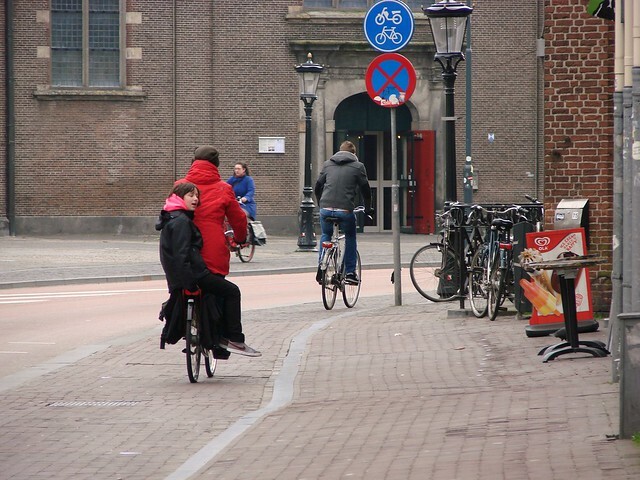 As you can see, there are specific lanes for the bicycles going each way, two lanes for the buses and occasional car, and sidewalks for pedestrians. There may be bicycles everywhere, but that doesn’t mean people don’t share a ride. Hopping on the back of the bike is done by everyone, both children and adults. 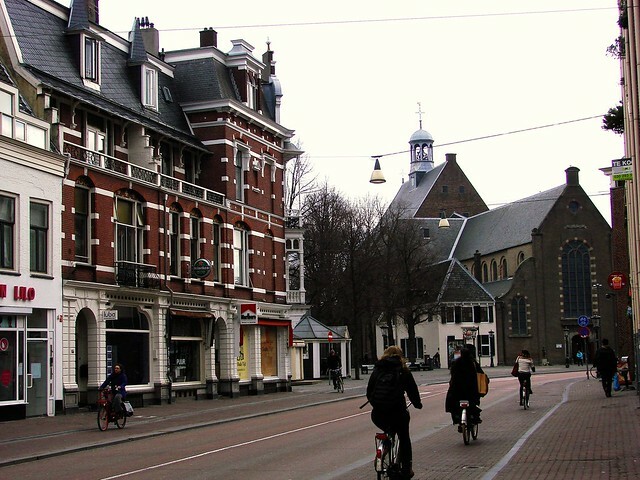 In the square in front of the church is the Broodje Mario shop stand. Mario’s is an institution in Utrecht, with the classic Broodje Mario made up of Italian meats and cheese and spicy vegetables, somewhat similar to a muffuletta in New Orleans. During the lunch hour, there’s usually a line of people and others milling about enjoying their sandwich. 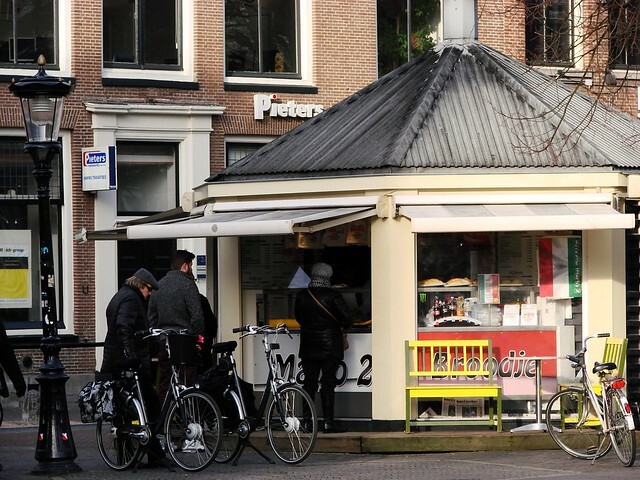 There’s no drive-through, but you can ride your bike practically right up to the shop. 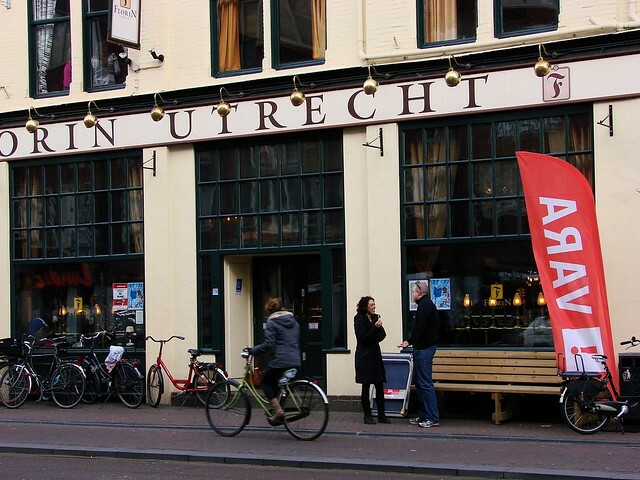 Our final stop on this brief journey highlighting a small segment of street life in Utrecht takes us to Florin, a bar/restaurant popular with the university students. On Saturday afternoons, they host live music events, so it’s not unusually to see signs, banners, and people standing outside chatting. And of course plenty of bicycles parked outside. This week’s theme is reflections, and though the concept can be more esoteric, reflecting on life, the universe, and everything else, I’m sticking with the more literal sense. Mainly because one of the things I love to photograph are reflections of the city in the surrounding windows. It’s a fun way to look at the city from a slightly different perspective. 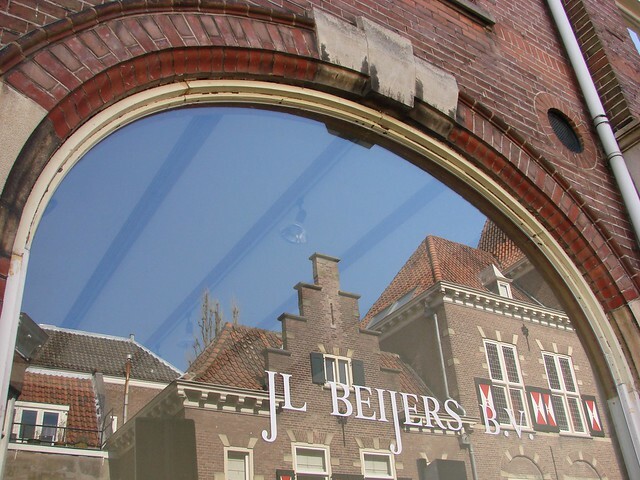 The sun was shining brightly yesterday and as I walked down Voetiusstraat to take a peek at the Domplein now that the construction tenting is gone, I found myself irresistibly drawn to the reflection of the classic Dutch buildings in the large window. The name on the window made the image look something like opening credits of a film (or an annoying watermark). I also like how the beams in the ceiling draw the eye into the image. Plus, I just love a good arch, especially with a stand-out keystone. This week’s Weekly Photo Challenge theme is “perspective”. Sitting at one of the terraces beneath the Domtoren yesterday, enjoying the sunshine, I couldn’t resist this photo of the tower, specifically because of the perspective. Some of the building and some of the perspective gets lost in the photo. You need to be sitting there, craning your neck back to see the top of the tower, 112 meters up in the sky, to really understand the immense size. It remains awe inspiring. 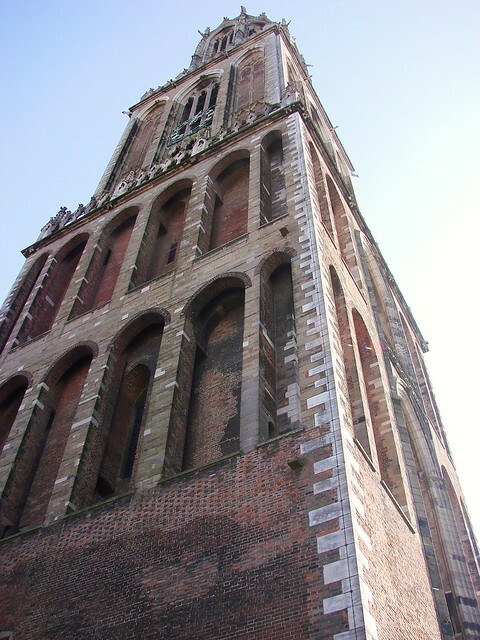 But I also have another new perspective on the Domtoren, in a more personal sense. 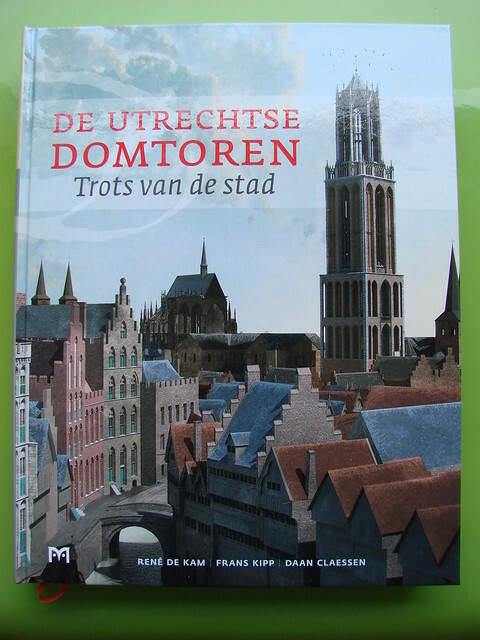 Saturday, a new book was published about the history of the Domtoren and its building process. The book weighs in around 2.5 kilos, and features a variety of illustrations showing some of the building (and renovation) processes, along with other related historic pictures. I had known for some time now that the book was being worked on and had been debating whether or not to pick up a copy of my own. Saturday, we stopped at the VVV offices (tourist info offices), because I wanted to see the book in person. (They had specifically mentioned having the book there.) Yet when I got there, it was no where to be found! Unless I missed it among the crowds, the only reference to it I saw was a picture of the cover in a display of other Domtoren related paraphernalia. Looking closer, it seemed as if the book wouldn’t be presented until later that afternoon. Disappointed, I figured I’d look for it another day. 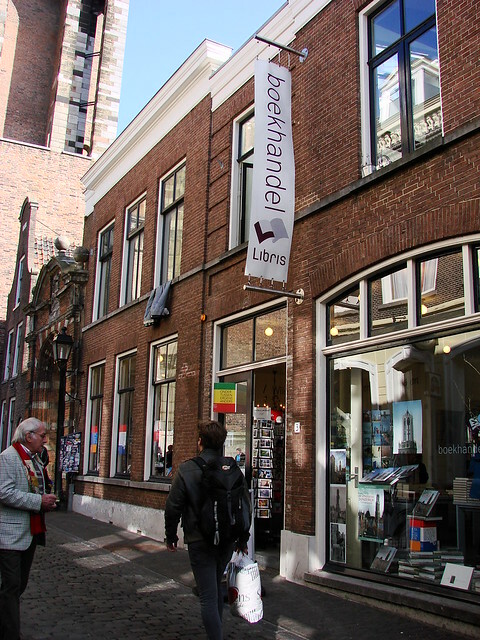 But then, just around the corner (and still in the shadow of the Domtoren), I saw a big display for the book at Libris book store. Obviously, I had to go in. I heaved up a copy and opened it. 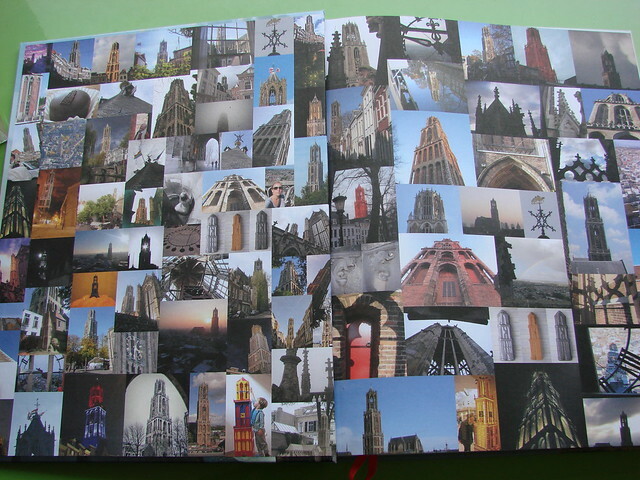 There, on the first inside pages, was a collection of various photos of the Domtoren, taken from different perspectives. I had seen this collage before in a promotional post about the book, but hadn’t been sure that it would actually be included. As soon as I saw it was, I knew then and there I had to buy a copy. 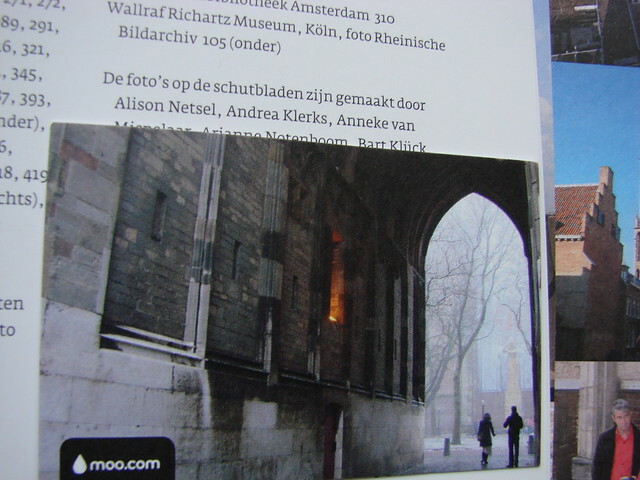 You see, one of my very own photos of the Domtoren was included! Mine is the view through the archway beneath the tower. 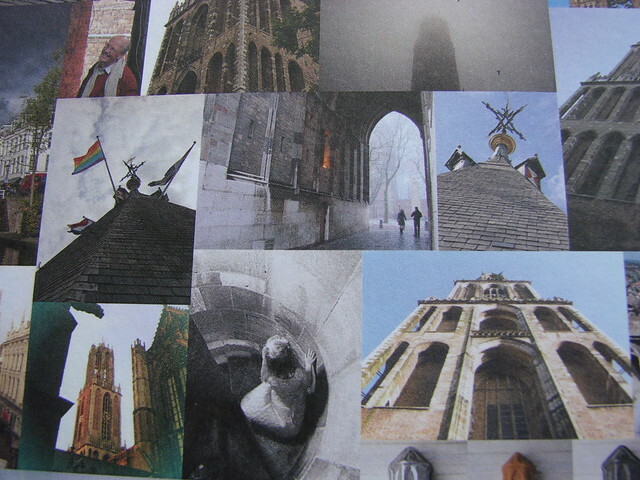 I had sent in the photo during a request last year for photos of the Domtoren, but hadn’t necessarily expected to have any of my photos included. I then flipped to the back of the book to check the index and yes, indeed, all of the participating photographers were mentioned. In fact, I was right there at the beginning! And in a bit of serendipity, that particular photo is the one I chose to use on some contact cards I recently had printed. I managed to restrain myself from pointing all of this out to the person at the register or the people in line around me. But that didn’t stop me from being rather giddy about it all for the rest of the day. After all of my blogging about the city and the Domtoren, by having my photo included in this important book, I feel a little bit more like I truly belong here in this city I’ve chosen to call home. I’ve become a miniscule part of the tower’s hundreds of years of history. This thrills me in the same way I still get a thrill every time I see the Domtoren, whether it’s up close or from a distance over the rooftops. I should also add that Saturday was my birthday. How’s that for a birthday present!